Roblin Lake Escape is a 3 bedroom waterfront cottage that sits picture perfect on the shores of Roblin Lake on a private dead end road. A dock, hammock and fire pit all are within steps of the cottage doors. There is a nearby park at a school and a ball diamond within a short driving distance. Walk into the cottage to find a entertainment room with games and a couch to view the lake on a rainy day. Off the kitchen you will find 2 bedrooms; one has a king bed and the other has a queen bed. There is also a pullout couch located in the main cottage in the front sunroom for any extra guests. Outside you will find the beautifully decorated seasonal bunkie that has a king bed. From May long weekend to Thanksgiving the cottage sleeps 6 in beds and 8 guests with the pull out couch. After Thanksgiving the cottage sleeps 4 in beds and 6 with pullout as the bunkie is closed. 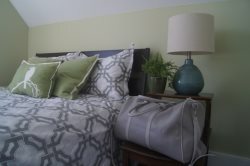 Bed and bath linens are supplied. There is one 3-piece bathroom in the cottage equipped with washer and dryer for your convenience. The kitchen is equipped with stove, microwave, fridge, toaster, kettle, drip coffee maker, utensils, cookware, dishes etc. Enjoy a meal at the kitchen table with seating for 6-10 people. Off the kitchen you will find a living room with 2 love seat couches and a comfy chair. A ceiling fan helps keep this room cool if the breeze off the water isn’t doing the trick. Find a television with a apple box and digital antenna for your enjoyment as well as Wifi internet. Please note there is no central a/c at this property. A propane BBQ is available for your use. The waterfront offers a rock shore with shallow gradual entry, great for kids or those that like to ease into the water. The dock is also available for guests to use for swimming, boating or fishing. There is a small boat launch on the property as well. A fire pit sits perfectly by the shore to enjoy star gazing by the lake. There is parking for 2-3 cars in the driveway. Please note that there are neighbours on either side of the property. PLEASE NOTE: The water is not drinkable. Water is safe for bathing and doing dishes. Dogs are allowed upon approval. Please ASK. There is a $50 pet fee per pet. One (1) park pass is included for guest use. Excellent stay! Would definitely book again. Had an amazing 3 nights at the Roblin Lake Escape, a really beautiful space which comfortably held 6 adults and 2 dogs. We cannot recommend this space enough. The home is exactly as per the photos and we had a blast with our paddleboards and kayaks on the lake. This place is PERFECT for small groups with little kids. We went with our three year old and another couple with kids the same age. It was great to let the kids run around and not really worry about stairs or unsafe areas. The place has been newly renovated and is clean and well stocked. We stayed in the bunky and it was perfect. The cottage is actually much bigger in person than in the pictures! Loved the fire pit near the lake for night time drinks and s'mores, the hammock was great and the dock a good size. Can't wait to go back! Pets may be allowed upon request. A $50 cleaning fee per pet will apply. Please ASK before bringing pets. Please let us know breed.